I am in charge of our social media outlets, where my job is to dig up and publish interesting content that our collectors want to see and hear about. Needless to say, I think I have one of the coolest jobs at Upper Deck. 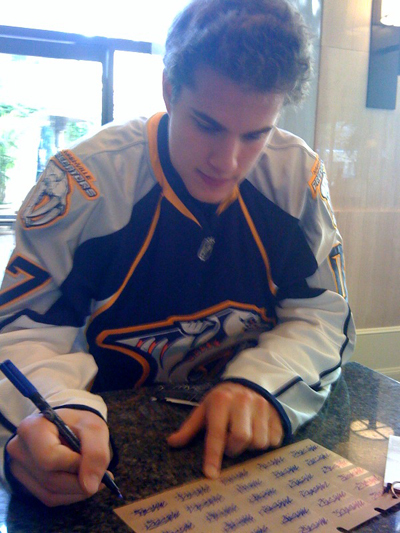 Just today, I got to meet NHL rookie Mike Santorelli of the Nashville Predators for a signing and short interview session for our Facebook and Twitter pages. Although the session was only about fifteen minutes long, I got plenty of Tweets and Facebook comments, and of course it’s always fun to be able to meet the athletes we work with! Check out the video shoutout below. Nice Carrie! Yeah, you do have the best job ever, lol.